The rankings proclaim it. The double-decker bus wraps brag about it. And now the Arizona State University community is coming together to celebrate it: Innovation Day on Friday, Nov. 16, is a university-wide celebration of the efforts of faculty, staff and students to try new things and take on grand challenges. “Innovation is happening in so many ways across the institution, and there are so many people doing innovative things, but a lot of those pieces are invisible to the larger university,” said Minu Ipe, knowledge enterprise architect at ASU and Innovation Day organizer. Nov. 16 will be a time to stop and celebrate the things people are doing at ASU. Innovation Day will begin in the morning with units across the four campuses marking the day in various ways, from hackathons to wellness events. The celebration culminates with a festival of discovery at Sun Devil Stadium from 3 to 5 p.m., after which internationally renowned vocal artist and beatboxer Reggie Watts will take the stage with a performance that blends music and comedy (tickets, which are free and available on the ASU mobile app, are required for the Watts show). A performance by vocal artist and comedian Reggie Watts will serve as the finale to Innovation Day. His performances are 100 percent improvised, and no two are alike. LA Weekly crowned him "the most wildly inventive new talent of the past five years." Photo courtesy Reggie Watts. The exhibits at the stadium — ranging from interactive Changemaker activities and a Sun Devil Athletics equipment-tech showcase to virtual-reality demos and student-created health apps — are just an example of what is occurring across the university, Ipe said. It will spotlight new approaches to learning and even to operational processes. Innovation is a mindset, Ipe said, one that exists across disciplines and functions at the university. It’s also not just the outcome, but the process as well. That process will be on display at Innovation Day, where many of the exhibits will be interactive, asking participants to offer their ideas. ASU partners will also be represented, with a Starbucks Nitro Brew Bicycle (a mobile Nitro cold-brew machine that shows how the nitrogen-charged coffee is made) on display and an adidas creator lab where participants can develop prototypes of shoes and other products. For those who cannot be at the stadium in person, the event will be livestreamed on ASU’s Facebook page. There’s a myth about innovation that it’s the work of a lone genius inspired by an “aha” moment, Ipe said. “Innovation happens when people come together to solve problems they care about. But it’s a chaotic, messy process” in which some ideas fail but ultimately something works, Ipe said. It’s also the prerogative of everyone. She hopes that people leave Innovation Day not just with a better understanding of the work being done at ASU, but with a stronger sense of community. A return to civilian life after military service can sometimes take some adjustments for veterans. 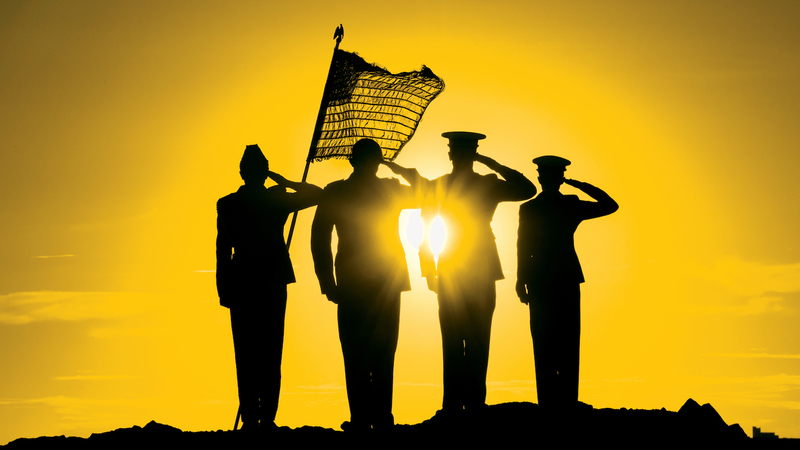 At Arizona State University, the Pat Tillman Veterans Center helps veterans, active duty military members, and their spouses and dependents prepare for academic success as college students. A Fulton Schools computer science doctoral student was recently recognized as an exceptional student veteran leader. Vivin Paliath was named one of 60 national Tillman Scholars by the Pat Tillman Foundation this summer. The former logistics specialist in the Arizona Army National Guard plans to continue his service as a civilian by protecting computer networks. He currently builds software for a cybersecurity and threat intelligence startup company while he pursues his degree. Tremayne Holland, an aeronautical management technology major focusing on unmanned aerial systems, served in the United States Navy as an in-flight avionics technician aboard P-3C Orion aircraft. Holland chose to attend ASU after deciding to get out of the military. The veteran community at ASU helped Holland with his decision to attend ASU. He attended the student veteran welcome event during his first semester on campus and it helped reassure him he’d made the correct decision. The Pat Tillman Veterans Center helped Holland adjust in his return to college life after his academic hiatus. Following high school in 2004, Holland initially enrolled at Brewton Parker College in Mount Vernon, Georgia, attending the school for three years on a baseball scholarship. Then in 2007, Holland was drafted by the Los Angeles Angels of Anaheim in the 20th round the Major League Baseball amateur draft to start off his professional baseball career. He played in the minor leagues until being sidelined by a shoulder injury. After exciting careers in baseball and the Navy, Holland eventually found himself at home on ASU’s Polytechnic campus. The Claxton, Georgia, native didn’t want to lose the aviation experience that he had gained in the military, so he wanted to pursue engineering and aeronautical management technology as his major in the Fulton Schools. The Pat Tillman Veterans Center didn’t just help Holland readjust to campus life, it gave him an opportunity to give back. Holland works as a military outreach team member in the center. The legend of Pat Tillman resonates all across ASU and the legacy of his life and principles live on through ASU’s active military, veteran and dependent students, whether they are on campus or online. Holland appreciates all of the support he has received in his journey. Sharice Lewis, an engineering management major pursuing her degree online while living in the Atlanta suburb of Alpharetta, Georgia, served in the United States Air Force for more than six years in diagnostic imaging, starting a year after graduating from high school. When she first joined the Air Force, Lewis admits that she was immature and didn’t know how to properly deal with conflict and adversity. Lewis’ husband is a fellow veteran who attended college in Mississippi and had a less than stellar experience as a veteran, so she was impressed by the support that ASU offers veterans through the Pat Tillman Veterans Center. A strategic planning board meeting while serving at the clinic on Luke Air Force Base near Glendale, Arizona, helped instigate Lewis’ interest in engineering management. The Tillman Center didn’t just help Lewis get to ASU, it helped her obtain an experience she says has been the most rewarding part of her studies: a Focus Forward Fellowship from the Military Family Research Institute (MFRI) at Purdue University. She is one of 20 students nationally selected for the 2018 program. The fellowship is a yearlong process that started this past summer. In July, during the residency portion of the fellowship, Lewis had the opportunity to visit Purdue University. During the residency, she learned about her strengths in a work setting and about her personality type in professional dynamics. Many of the activities did not only focus on teaching participants about themselves, but rather how they fit into professional settings and how to cope with different personality types and resolve conflicts to become great leaders. With the residency portion of the fellowship now complete, Lewis has a yearlong follow up through the MFRI online community. Lewis wants to continue her education once she graduates, but she isn’t sure what path she wants to follow. Lewis isn’t just focused on her own future. She has her sights set doing meaningful work and helping communities around the world. Studying in the Fulton Schools and participating as an MFRI scholar is moving Lewis closer to her goals.